Basic advice to writers: create an enticing beginning. The lead, as it is called, is the writer's opportunity to catch the reader's interest so he or she wants to keep reading. So, when the subject is sharks, it is mighty tempting to start with a dramatic scene--of a big dorsal fin cutting through the water, of a gaping mouth with many sharp teeth--a scene that in many minds evokes some musical notes from the film Jaws. I resisted that temptation when I wrote the lead of Sharks! Strange and Wonderful. I did so for two reasons. First, sharks are so diverse and fascinating, it is misleading to concentrate on the few species that rarely harm people. Second, sharks deserve and need a de-emphasis on their image as people-eaters. Peter Benchley, who gained fame and wealth as a result of the novel Jaws and the films that followed, has expressed regret about his contribution to public attitudes about sharks. In 1998 Benchley wrote, "I couldn't possibly write Jaws today. We know so much more about sharks--and just as important, about our position as the single most careless, voracious, omnivorous destroyer of life on earth--that the notion of demonizing a fish strikes me as insane." 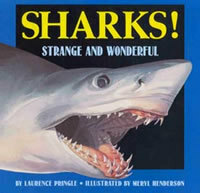 Although the book's jacket shows a mako shark with some nasty-looking teeth, readers soon learn about the great variety of sharks in the seas--not just makos and tigers, but angels, wobbegongs, and cookiecutters! They learn something about the importance of sharks in ocean ecology and the terrible killing of sharks now underway. Aside from seeing reviews of this book, I will never know what effect it has on readers. But, I'm a hopeful person, and I imagine kids across the continent agreeing with me: Once you get to know them, sharks are wonderful!